I recently had a chance to photograph the Hollywood sign in Burbank, CA and I figured this would be a great blog entry to put together since a lot of the information available isn’t very clear. Hopefully this gives you all the info you need if you’re looking to photograph or hike to the sign. Step 1: type in “Wonder View Trail Head” into google maps. The trail head will pop up. This is the trail that leads up to both the Wisdom Tree and then on to the Hollywood sign. Note: this is a harder hike. You can also access the Hollywood Sign from a few other places. This is the hardest option but it’s also the shortest option. The parking is located along Lake Hollywood Drive at the corner of Lake Hollywood Drive and Wonder View Drive. It’s important to note that there is no parking between 9pm and 6am. So if you plan on doing a sunrise hike keep that in mind. There are several routes to get up to the Hollywood Sign. The route I chose to take took about an hour each way. It’s a steeper route but a lot shorter. I think the overall distance was about 1.5 miles each way. For this hike you will first hike up to the Wisdom Tree (another photo spot) and then along the ridge to the Hollywood Sign. If you’re looking to get some sunset shots make sure you leave the parking lot around 2+ hours prior to sunset. Once you get up to the top of the hike you will be looking at the back of the Hollywood sign, towards downtown Los Angeles. It’s important to note that there are a ton of people that hike up here so be ready to battle some crowds. I did quite a bit of scouting to try and find the best spot to photograph the sign and all in all it’s actually kind of a pain. 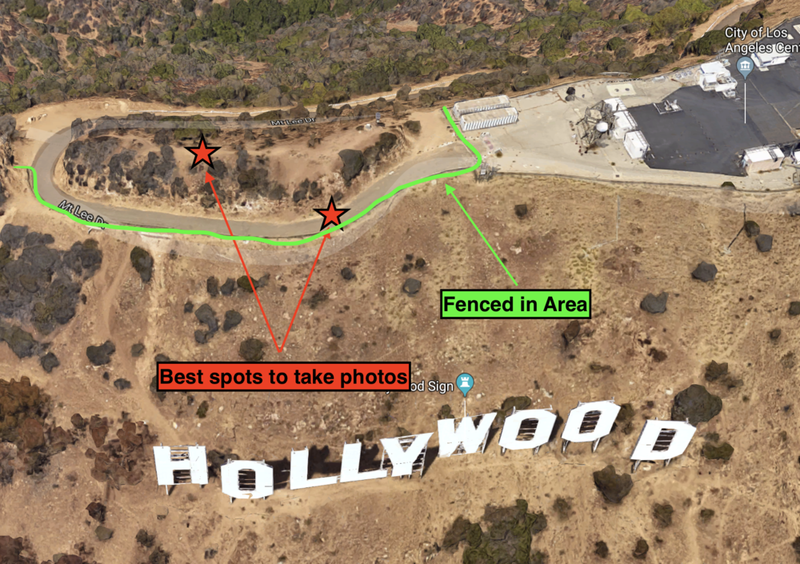 There is a 6’ green fence that separates the viewing area and the Hollywood Sign. Unfortunately this fence is in your shot if you try to photograph from the top of the hill. If you go behind the fence on the road you will also have issues seeing through the fence since the city opted to use small chain links. This is shot from the top of the hill, you can see the tall green fence that gets in all the shots. I personally found that the best shot is taken on top of the fence. I ended up taking my Joby Gorilla Pod and used that so I could get a nice shot just over the fence. However, if you’re short this might be somewhat difficult. I am over 6’3” and you can see how far up the fence is from where I was standing. Below is the shot I managed to take from that point of view. If you’re looking for a good lens to bring I will say the majority of my best shots were taken with a wide open 16mm lens. At that distance you tend to lose a little bit of LA in background. If you’d like to include downtown LA, I’d recommend zooming in to around 50mm. You will lose a lot of the signage but you do get a lot more of the actual city. This shot was taken at 56mm. It’s about as zoomed in as you can get to see the city and also get a shot of the sign. I think one key to photographing the sign is trying to get a bit creative. There is really only one spot where you can get some decent shots so you kind of have to think outside the box if you want to get a good photo. I personally liked this one of the fence. I also think getting a nice panorama is great for this location. 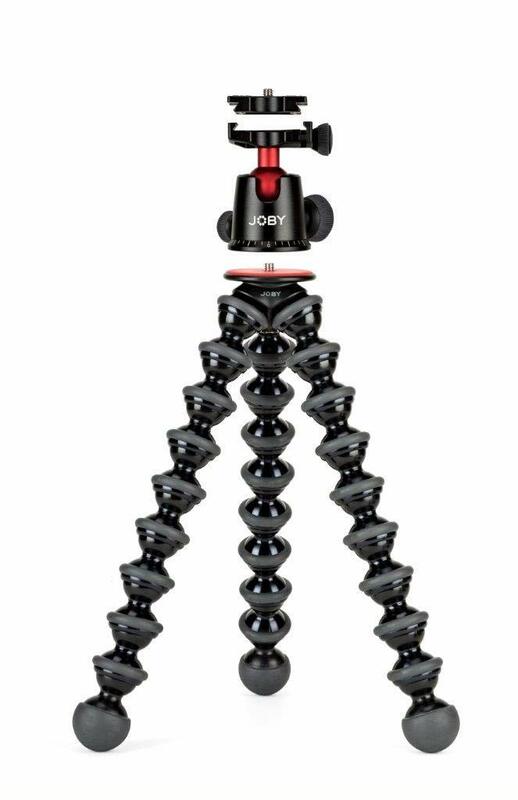 Again, I ended up using my Joby Gorilla Pod for the shot. Want to see another photo? Of course you don’t but here you go anyways.